Retailer John Lewis has teamed up with the The Furniture Recycling Group (TFRG) in an attempt to stop tens of thousands of mattresses being lost to landfill every year. In the UK, some 167,000 tonnes of mattresses are sent to landfill every year, and the partnership says that it aims to change the way manufacturers and retailers deal with end user customer waste, resulting in the waste stream’s diversion from costly and environmentally damaging landfill. The question of mattress recycling poses a headache for waste operators, given their bulky nature and subsequent difficulty in transporting them in large numbers. The most recent recycling figures from the National Bed Federation’s (NBF) latest ‘End of Life Mattress Report’ show that between 2014 and 2015, mattress recycling rates fell from 16 per cent to 13 per cent across the UK, while local authorities, which account for 81 per cent of mattress recycling, reported an 11 per cent decrease in their mattress recycling. Given the importance of mattresses to the range of home products offered by John Lewis, and the difficulty in recycling them, it stands to reason that John Lewis would take this step to help customers to responsibly dispose of their old mattresses. As part of the partnership, John Lewis is offering a mattress recycling service whenever an order is taken for a new mattress, whereby John Lewis will pick up customers’ old mattresses and take them to one of its distribution hubs before onward transport to TFRG in Blackburn. There the mattresses are broken down into their constituent parts using TFRG’s new mattress recycling machine, before they are repurposed and refashioned into new mattresses, thus closing the loop on the mattress production chain. The partnership has already been in action for a year and John Lewis says that in 2016 its recycling service enabled the recycling of around 58,000 mattresses – equating to 1,500 tonnes of waste diverted from landfill. Speaking about the partnership, Ben Thomas, Sustainability Manager at John Lewis, said: “For our mattress recycling service, we knew we needed to find a partner who would be trustworthy and had a plan for the future. After conducting thorough research into the industry it became clear that Nick Oettinger at The Furniture Recycling Group was the person we wanted to work with. Waste created by students decamping from their halls has been addressed by a partnership between the University of St Andrews and The Furniture Recycling Group. 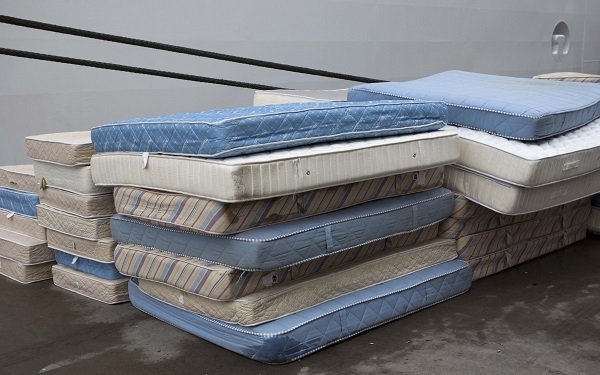 Mattress recycling has fallen in the UK since 2014, according to a new report by the National Bed Federation. A man found guilty of running an illegal mattress disposal operation in Norwich that involved illicit shipment of waste to Egypt has been sentenced along with the owners of the site where the operation was based. Retailer John Lewis launches sofa reuse scheme with Furniture Re-use Network to ‘relieve poverty and reduce waste’.